"Doors" redirects here. For the band, see The Doors. 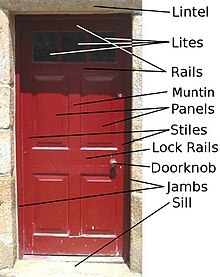 For other uses, see Door (disambiguation). A door is a panel that makes an opening in a building, room or vehicle. Doors are usually made of a hard, semi-permeable, and hard-to-break substance (such as wood or metal), but sometimes consisting of a hard frame into which windows or screens have been fitted. Doors are often attached by hinges to a frame. Doors make ingress into or egress from a building, room, or vehicle easier to manage. The panel may be moved in various ways (at angles away from the frame, by sliding on a plane parallel to the frame, by folding in angles on a parallel plane, or by spinning along an axis at the center of the frame) to allow or prevent ingress or egress. In most cases, a door's interior matches its exterior side. But in other cases (e.g., a vehicle door) the two sides are radically different. Often doors have locking mechanisms to ensure that only some people can open them. Doors can have devices such as knockers or doorbells by which people outside can announce their presence and summon someone either to open the door for them or give permission to open and enter. Apart from providing access into and out of a space, doors can have the secondary functions of ensuring privacy by preventing unwanted attention from outsiders, of separating areas with different functions, of allowing light to pass into and out of a space, of controlling ventilation or air drafts so that interiors may be more effectively heated or cooled, of dampening noise, and of blocking the spread of fire. The earliest in records are those represented in the paintings of some Egyptian tombs, in which they are shown as single or double doors, each in a single piece of wood. Doors were once believed to be the literal doorway to the afterlife, and some doors leading to important places included designs of the afterlife. In Egypt, where the climate is intensely dry, there would be no fear of their warping, but in other countries it would be necessary to frame them, which according to Vitruvius (iv. 6.) was done with stiles (sea/si) and rails (see: Frame and panel): the spaces enclosed being filled with panels (tympana) let into grooves made in the stiles and rails. The stiles were the vertical boards, one of which, tenoned or hinged, is known as the hanging stile, the other as the middle or meeting stile. The horizontal cross pieces are the top rail, bottom rail, and middle or intermediate rails. The most ancient doors were made of timber, such as those referred to in the Biblical depiction of King Solomon's temple being in olive wood (I Kings vi. 31-35), which were carved and overlaid with gold. The doors dwelt upon in Homer would appear to have been cased in silver or brass. Besides olive wood, elm, cedar, oak and cypress were used. A 5,000-year-old door has been found by archaeologists in Switzerland. All ancient doors were hung by pivots at the top and bottom of the hanging stile which worked in sockets in the lintel and sill, the latter being always in some hard stone such as basalt or granite. Those found at Nippur by Dr. Hilprecht dating from 2000 B.C. were in dolerite. The tenons of the gates at Balawat were sheathed with bronze (now in the British Museum). These doors or gates were hung in two leaves, each about 8 ft 4 in (2.54 m) wide and 27 ft (8.2 m). high; they were encased with bronze bands or strips, 10 in. high, covered with repouss decoration of figures, etc. The wood doors would seem to have been about 3 in. thick, but the hanging stile was over 14 inches (360 mm) diameter. Other sheathings of various sizes in bronze have been found, which proves this to have been the universal method adopted to protect the wood pivots. In the Hauran in Syria, where timber is scarce the doors were made in stone, and one measuring 5 ft 4 in (1.63 m) by 2 ft 7 in (0.79 m) is in the British Museum; the band on the meeting stile shows that it was one of the leaves of a double door. 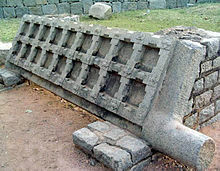 At Kuffeir near Bostra in Syria, Burckhardt found stone doors, 9 to 10 ft (3.0 m). high, being the entrance doors of the town. 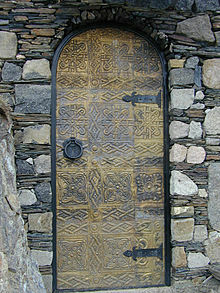 In Etruria many stone doors are referred to by Dennis. 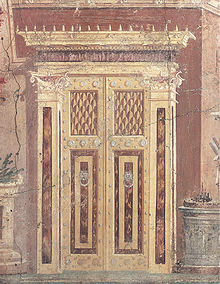 The ancient Greek and Roman doors were either single doors, double doors, triple doors, sliding doors or folding doors, in the last case the leaves were hinged and folded back. In Eumachia, is a painting of a door with three leaves. In the tomb of Theron at Agrigentum there is a single four-panel door carved in stone. In the Blundell collection is a bas-relief of a temple with double doors, each leaf with five panels. Among existing examples, the bronze doors in the church of SS. Cosmas and Damiano, in Rome, are important examples of Roman metal work of the best period; they are in two leaves, each with two panels, and are framed in bronze. Those of the Pantheon are similar in design, with narrow horizontal panels in addition, at the top, bottom and middle. Two other bronze doors of the Roman period are in the Lateran Basilica. Copper and its alloys were integral in medieval architecture. The doors of the church of the Nativity at Bethlehem (6th century) are covered with plates of bronze, cut out in patterns. Those of Hagia Sophia at Constantinople, of the 8th and 9th century, are wrought in bronze, and the west doors of the cathedral of Aix-la-Chapelle (9th century), of similar manufacture, were probably brought from Constantinople, as also some of those in St. Marks, Venice. The bronze doors on the Aachen Cathedral in Germany date back to about AD 800. Bronze baptistery doors at the Cathedral of Florence were completed in 1423 by Ghiberti. (For more information, see: Copper in architecture). 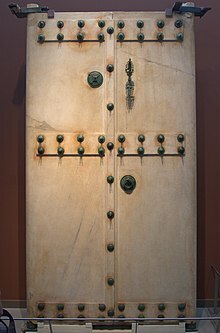 Of the 11th and 12th centuries there are numerous examples of bronze doors, the earliest being one at Hildesheim, Germany (1015). 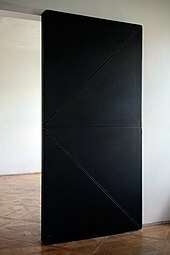 The Hildesheim design affected the concept of Gniezno door in Poland. Of others in South Italy and Sicily, the following are the finest: in Sant Andrea, Amalfi (1060); Salerno (1099); Canosa (1111); Troia, two doors (1119 and 1124); Ravello (1179), by Barisano of Trani, who also made doors for Trani cathedral; and in Monreale and Pisa cathedrals, by Bonano of Pisa. In all these cases the hanging stile had pivots at the top and bottom. The exact period when the hinge was substituted is not quite known, but the change apparently brought about another method of strengthening and decorating doors, viz, with wrought-iron bands of infinite varieties of design. As a rule three bands from which the ornamental work springs constitute the hinges, which have rings outside the hanging stiles fitting on to vertical tenons run into the masonry or wooden frame. There is an early example of the 12th century in Lincoln; in France the metal work of the doors of Notre Dame at Paris is perhaps the most beautiful in execution, but examples are endless throughout France and England. Returning to Italy, the most celebrated doors are those of the Battistero di San Giovanni (Florence), which together with the door frames are all in bronze, the borders of the latter being perhaps the most remarkable: the modeling of the figures, birds and foliage of the south doorway, by Andrea Pisano (1330), and of the east doorway by Ghiberti (1425–1452), are of great beauty; in the north door (1402–1424) Ghiberti adopted the same scheme of design for the paneling and figure subjects in them as Andrea Pisano, but in the east door the rectangular panels are all filled, with bas-reliefs, in which Scripture subjects are illustrated with innumerable figures, these being probably the gates of Paradise of which Michelangelo speaks. The doors of the mosques in Cairo were of two kinds; those which, externally, were cased with sheets of bronze or iron, cut out in decorative patterns, and incised or inlaid, with bosses in relief; and those in wood, which were framed with interlaced designs of the square and diamond, this latter description of work being Coptic in its origin. The doors of the palace at Palermo, which were made by Saracenic workmen for the Normans, are fine examples and in good preservation. A somewhat similar decorative class of door to these latter is found in Verona, where the edges of the stiles and rails are beveled and notched. 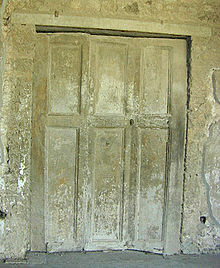 In the Renaissance period the Italian doors are quite simple, their architects trusting more to the doorways for effect; but in France and Germany the contrary is the case, the doors being elaborately carved, especially in the Louis XIV and Louis XV periods, and sometimes with architectural features such as columns and entablatures with pediment and niches, the doorway being in plain masonry. While in Italy the tendency was to give scale by increasing the number of panels, in France the contrary seems to have been the rule; and one of the great doors at Fontainebleau, which is in two leaves, is entirely carried out as if consisting of one great panel only. The earliest Renaissance doors in France are those of the cathedral of St. Sauveur at Aix (1503). In the lower panels there are figures 3 ft (0.91 m). high in Gothic niches, and in the upper panels a double range of niches with figures about 2 ft (0.61 m). high with canopies over them, all carved in cedar. The south door of Beauvais Cathedral is in some respects the finest in France; the upper panels are carved in high relief with figure subjects and canopies over them. The doors of the church at Gisors (1575) are carved with figures in niches subdivided by classic pilasters superimposed. In St. Maclou at Rouen are three magnificently carved doors; those by Jean Goujon have figures in niches on each side, and others in a group of great beauty in the center. The other doors, probably about forty to fifty years later, are enriched with bas-reliefs, landscapes, figures and elaborate interlaced borders. NASA's Vehicle Assembly Building at the Kennedy Space Center contains the four largest doors. The Vehicle Assembly Building was originally built for the assembly of the Apollo missions' Saturn vehicles and was then used to support Space Shuttle operations. Each of the four doors are 139 meters (456 feet) high. The oldest door in England can be found in Westminster Abbey and dates from 1050. In England in the 17th century the door panels were raised with bolection or projecting moldings, sometimes richly carved, round them; in the 18th century the moldings worked on the stiles and rails were carved with the egg and tongue ornament. A ledge and brace door often called board and batten doors are made from multiple vertical boards fixed together by two or more horizontal timbers called ledges (or battens)and sometimes kept square by additional diagonal timbers called braces. A false door is a wall decoration that looks like a window. In ancient Egyptian architecture, this was a common element in a tomb, the false door representing a gate to the afterlife. They can also be found in the funerary architecture of the desert tribes (e.g., Libyan Ghirza). A doormat (also called door mat) is a mat placed typically in front of or behind a door of a home. This practice originated so that mud and dirt would be less prevalent on floors inside a building. Doors which slide inside a wall cavity are called pocket doors. This type of door is used in tight spaces where privacy is also required. The door slab is mounted to roller and a track at the top of the door and slides inside a wall. A high-speed door is a very fast door some with opening speeds of up to 4 m/s, mainly used in the industrial sector where the speed of a door has an effect on production logistics, temperature and pressure control. high-speed clean room doors are used in pharmaceutical industries for the special curtain and stainless steel frames. They guarantee the tightness of all accesses. The powerful high-speed doors have a smooth surface structure and no protruding edges. Therefore, they can be easily cleaned and depositing of particles is largely excluded. High-speed doors are made to handle a high number of openings, generally more than 200,000 a year. They need to be built with heavy-duty parts and counterbalance systems for speed enhancement and emergency opening function. The door curtain was originally made of PVC, but was later also developed in aluminium and acrylic glass sections. High Speed refrigeration and cold room doors with excellent insulation values was also introduced with the Green and Energy saving requirements. Evolution Door is a trackless door that moves in the same closure level as a sliding door. The system is an invention of the Austrian artist Klemens Torggler. It is a further development of the Drehplattentür [de] that normally consists of two rotatable, connected panels which move to each other when opening. Stiles – Vertical boards that run the full height of a door and compose its right and left edges. The hinges are mounted to the fixed side (known as the "hanging stile"), and the handle, lock, bolt or latch are mounted on the swinging side (known as the "latch stile"). Rails – Horizontal boards at the top, bottom, and optionally in the middle of a door that join the two stiles and split the door into two or more rows of panels. The "top rail" and "bottom rail" are named for their positions. The bottom rail is also known as "kick rail". A middle rail at the height of the bolt is known as the "lock rail", other middle rails are commonly known as "cross rails". 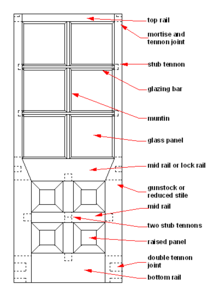 Mullions – Smaller optional vertical boards that run between two rails, and split the door into two or more columns of panels, the term is used sometimes for verticals in doors, but more often (UK and Australia) it refers to verticals in windows. Muntin – Optional vertical members that divide the door into smaller panels. Panels – Large, wider boards used to fill the space between the stiles, rails, and mullions. The panels typically fit into grooves in the other pieces, and help to keep the door rigid. Panels may be flat, or in raised panel designs. Can be glued in or stay as a floating panel. Light or Lite – a piece of glass used in place of a panel, essentially giving the door a window. Planks – Boards wider than 9" that extend the full height of the door, and are placed side by side filling the door's width. Ledges and braces – Ledges extend horizontally across the door which the boards are affixed to. The ledges hold the planks together. When diagonally they are called braces which prevent the door from skewing. 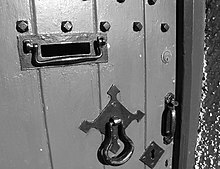 On some doors, especially antique ones, the ledges are replaced with iron bars that are often built into the hinges as extensions of the door-side plates. Impact-resistant doors have rounded stile edges to dissipate energy and minimize edge chipping, scratching and denting. The formed edges are often made of an engineered material. Impact-resistant doors excel in high traffic areas such as hospitals, schools, hotels and coastal areas. This type consists of a solid timber frame, filled on one face, face with Tongue and Grooved boards. Quite often used externally with the boards on the weather face. Stiles and rails – As above, but usually smaller. They form the outside edges of the door. Core material: Material within the door used simply to fill space, provide rigidity and reduce drumminess. Hollow-core – Often consists of a lattice or honeycomb made of corrugated cardboard, or thin wooden slats. Can also be built with staggered wooden blocks. Hollow-core flush doors are commonly used as interior doors. 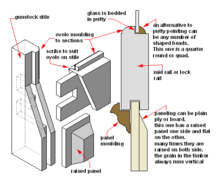 Lock block – A solid block of wood mounted within a hollow-core flush door near the bolt to provide a solid and stable location for mounting the door's hardware. Stave-core – Consists of wooden slats stacked upon one another in a manner similar to a board and batten door (though the slats are usually thinner) or the wooden-block hollow-core (except that the space is entirely filled). Solid-core – Can consist of low-density particle board or foam used to completely fill the space within the door. Solid-core flush doors (especially foam-core ones) are commonly used as exterior doors because they provide more insulation and strength. Skin – The front and back faces of the door are then covered with wood veneer, thin plywood, sheet metal, fiberglass, or vinyl. The wooden materials are usually layered with the grain alternating direction between layers to prevent warping. 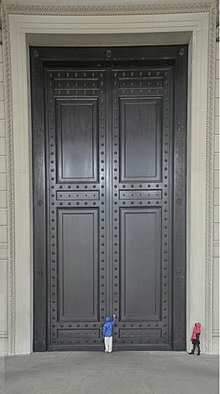 Fiberglass and metal-faced doors are sometimes given a layer of cellulose so that they may be stained to look like wood. Core material: Material within the door used simply to fill space, provide rigidity and reduce druminess. Hollow-core – Often consists of a lattice or honeycomb made of corrugated cardboard, extruded polystyrene foam, or thin wooden slats. Can also be built with staggered wooden blocks. Hollow-core molded doors are commonly used as interior doors. Stave-core – Consists of wooden slats stacked upon one another in a manner similar to a board & batten door (though the slats are usually thinner) or the wooden-block hollow-core (except that the space is entirely filled). Skin – The front and back faces of the door are covered with HDF / MDF skins. Door swings For most of the world, door swings, or handing, are determined while standing on the outside or less secure side of the door while facing the door (i.e., standing on the side requiring a key to open, going from outside to inside, or from public to private). It is especially important to get the hand and swing correct on exterior doors, as the transom is usually sloped and sealed to resist water entry, and to properly drain. In some custom millwork (or with some master carpenters), the manufacture or installer will bevel the leading edge (the first edge to meet the jamb as the door is closing) so that the door fits tight without binding. Specifying an incorrect hand or swing will cause the door to bind, not close properly or leak (for exterior doors). Fixing this specification error will be expensive or time consuming. In North America, many doors now come with factory-installed hinges, pre-hung on the jamb and sills. While facing the door from the outside or less secure side, if the hinge is on the right side of the door, the door is "right handed"; or if the hinge is on the left, it is "left handed". If the door swings toward you, it is "reverse swing"; or if the door swings away from you, it is "Normal swing". One of the oldest DIN standard applies: DIN 107 "Building construction; identification of right and left side" (first 1922-05, current 1974-04) defines that doors are categorized from the side where the door hinges can be seen. If the hinges are on the left, it is a DIN Left door (DIN links, DIN gauche), if the hinges are on the right, it is a DIN Right door (DIN rechts, DIN droite). The DIN Right and DIN Left marking are also used to categorize matching installation material such as mortise locks (referenced in DIN 107). The European Standard DIN EN 12519 "Windows and pedestrian doors. Terminology" includes these definitions of orientation. 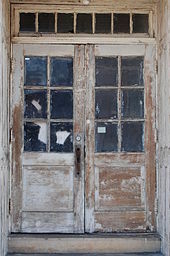 In public buildings, exterior doors should open to the outside in order to comply with any fire codes that may be in force in that jurisdiction. If the door opens inward and there is a fire, there can be a crush of people who run for the door and they will not be able to open it. Wooden doors – including solid wood doors – are a top choice for many homeowners, largely because of the aesthetic qualities of wood. Many wood doors are custom-made, but they have several downsides: their price, their maintenance requirements (regular painting and staining) and their limited insulating value  (R-5 to R-6, not including the effects of the glass elements of the doors). Wood doors often have an overhang requirement to maintain a warranty. An overhang is a roof, porch area or awning that helps to protect the door and its finish from UV rays. Steel doors are another major type of residential front doors; most of them come with a polyurethane or other type of foam insulation core – a critical factor in a building's overall comfort and efficiency. Most modern exterior walls are designed to provide thermal insulation and energy efficiency, which can be indicated by the Energy Star label or the Passive House standards. Premium composite (including steel doors with a thick core of polyurethane or other foam), fiberglass and vinyl doors benefit from the materials they are made from, from a thermal perspective. But there are very few door models with an R-value close to 10 (which is far less than the R-40 walls or the R-50 ceilings of super-insulated buildings – Passive Solar and Zero Energy Buildings). Typical doors are not thick enough to provide very high levels of energy efficiency. Many doors may have good R-values at their center, but their overall energy efficiency is reduced because of the presence of glass and reinforcing elements, or because of poor weatherstripping and the way the door is manufactured. Door weatherstripping is particularly important for energy efficiency. German-made Passive House doors use multiple weatherstrips, including magnetic strips, to meet higher standards. These weatherstrips are critical to reduce to a minimum energy losses due to air leakage. The standard door sizes in the US run along 2" increments. Customary sizes have a height of 78" (1981 mm) or 80" (2032 mm) and a width of 18" (472 mm), 24" (610 mm), 26" (660 mm), 28" (711 mm), 30" (762 mm) or 36" (914 mm). Most residential passage (room to room) doors are 30" x 80" (762 mm x 2032 mm). A standard US residential (exterior) door size is 36" x 80" (91 x 203 cm). Interior doors for wheelchair access must also have a minimum width of 3'-0" (91 cm). Residential interior doors are often somewhat smaller being 6'-8" high, as are many small stores, offices, and other light commercial buildings. Larger commercial, public buildings and grand homes often use doors of greater height. Older buildings often have smaller doors. Thickness: Most pre-fabricated doors are 1 3/8" thick (for interior doors) or 1 3/4" (exterior). Closets: small spaces such as closets, dressing rooms, half-baths, storage rooms, cellars, etc. often are accessed through doors smaller than passage doors in one or both dimensions but similar in design. The standard DIN doors are defined in DIN 18101 (published 1955-07, 1985-01, 2014-08). The door sizes are also given in the construction standard for wooden door panels (DIN 68706-1). The DIN commission was also responsible for the harmonized European standard DIN EN 14351-1 for exterior doors and DIN EN 14351-2 for interior doors (published 2006-07, 2010-08), which defines the requirements for the CE marking giving standard sizes by examples in the appendix. The DIN 18101 standard has a normative size (Nennmaß) slightly larger than the panel size (Türblatt) as the standard derives the panel sizes from the normative size being different single door vs double door and molded vs unmolded doors. The DIN 18101/1985 defines interior single molded doors to have a common panel height of 1985 mm (normativ height 2010 mm) at panel widths of 610 mm, 735 mm, 860 mm, 985 mm, 1110 mm, plus a larger door panel size of 1110 mm x 2110 mm. The newer DIN 18101/2014 drops the definition of just five standard door sizes in favor of a basic raster running along 125 mm increments where the height and width are independent. The panel width may be in the range 485 mm to 1360 mmm, and the height may be in the range of 1610 mm to 2735 mm. The most common interior door is 860 mm x 1985 mm (33.8" x 78.1"). When framed in wood for snug fitting of a door, the doorway consists of two vertical jambs on either side, a lintel or head jamb at the top, and perhaps a threshold at the bottom. When a door has more than one movable section, one of the sections may be called a leaf. See door furniture for a discussion of attachments to doors such as door handles, doorknobs, and door knockers. Threshold (for exterior doors) – A horizontal plate below the door that bridges the crack between the interior floor and the sill. Architrave – The decorative molding that outlines a door frame. (called an Archivolt if the door is arched). Called door casing or brickmold in North America. Door furniture or hardware refers to any of the items that are attached to a door or a drawer to enhance its functionality or appearance. This includes items such as hinges, handles, door stops, etc. Door safety relates to prevention of door-related accidents. Such accidents take place in various forms, and in a number of locations; ranging from car doors to garage doors. Accidents vary in severity and frequency. According to the National Safety Council in the United States, 300,000 injuries are caused by doors every year. The types of accidents vary from relatively minor cases where doors cause damage to other objects, such as walls, to serious cases resulting in human injury, particularly to fingers, hands, and feet. A closing door can exert up to 40 tons per square inch of pressure between the hinges. Because of the number of accidents taking place, there has been a surge in the number of lawsuits. Thus organisations may be at risk when car doors or doors within buildings are unprotected. However, inward-hinged doors can also escalate an accident by preventing people from escaping the building: people inside the building may press against the doors, and thus prevent the doors from opening. This was partly the case in the Grue Church fire in Norway in 1822. Today, the exterior doors of most large (especially public) buildings open outward, while interior doors such as doors to individual rooms, offices, suites, etc. open inward, as do many exterior doors of houses, particularly in North America. A safety door prevents finger injuries near the hinges without the use of door guards. Rather than cover the danger area, the approach is to change the shape of the door so that an accessible gap does not form in the first place. This is achieved by adding a perfectly circular ("bull-nose" shaped) extension to the door, which moves in and out of a cavity as the door opens and closes. This prevents any part of a hand being crushed near the hinges – either inside or outside. These doors have an operating range of slightly over 90 degrees, so their use is limited to where they come into contact with a side wall when fully open (or where they can be prevented from opening too far by a doorstop). Glass doors pose the risk of unintentional collision if a person believes the door to be open when it is closed, or is unaware there is a door at all. This risk may be particularly pronounced with sliding glass doors because they often have large single panes which are hard to see. To prevent injury from glass doors, stickers or other types of warnings are sometimes placed on the glass surface to make it more visible. For instance, in the UK, Regulation 14 of the Workplace (Health and Safety Regulations) 1992 requires the marking of windows and glass doors to make them conspicuous. Australian Standards: AS1288 and AS2208 require glass doors to be made from laminated, tempered or toughened glass. There may be an increased risk of trapping hands or fingers in car doors compared to other types of doors, due to the proximity in which the occupant sits. In some car accidents, injury to occupants from the movement of car doors may occur. Bicyclists often fear collision with an opening car door in case the car's occupant does not look carefully to check that it is safe to open the door. Because cyclists often ride near parked cars along the side of the road (see door zone) they are particularly vulnerable. Doors which lead from interior, pressurized, sections of an aircraft to exterior or unpressurized areas can pose extreme risk if they are inadvertently opened during flight. This can be mitigated by having doors that open inwardly and are designed to be forced into their door frames by the internal cabin pressure – most cabin doors are of this type. However, an outward opening door is often advantageous for cargo doors to maximise available space, and these need to be secured by hefty locking mechanisms to overcome internal pressure. ^ See, for example the doorkeeping duties of the Gentleman Usher of the Black Rod. ^ a b Needham, Joseph. (1986). Science and Civilization in China: Volume 4, Part 2, Mechanical Engineering. Taipei: Caves Books, Ltd.
^ Howard R. Turner (1997), Science in Medieval Islam: An Illustrated Introduction, p. 181, University of Texas Press, ISBN 0-292-78149-0. ^ "Vehicle Assembly Building Fact Sheet" (PDF). NASA. NASA. Archived (PDF) from the original on 2016-10-11. Retrieved 2016-06-03. ^ "Abbey oak door 'Britain's oldest'". BBC News. 2005-08-03. Archived from the original on 2006-06-20. Retrieved 2010-05-01. ^ Nicholson, Peter (1841). The New and Improved Practical Builder. London: Thomas Kelly. pp. 97–98. ^ "What does 'certificated' to PAS 24 actually mean?". thecrimepreventionwebsite.com. Archived from the original on 2014-01-25. ^ "Henleys Security Doors". Henleys Security Doors. Archived from the original on 30 May 2016. Retrieved 25 May 2016. ^ "Front Doors, Garage Doors Insights from The Door Zone". The Door Zone. Archived from the original on 2017-05-07. Retrieved 2017-05-11. ^ Kinematics with MicroStation Ch01C-I Grueblers Criteria for 3D 5 Bar. YouTube. 20 February 2014. Archived from the original on 9 April 2016. ^ "Doors in Venice: among water, art and architecture". See Venice, Italy. Archived from the original on 2018-01-03. ^ Water doors make frequent appearances in Donna Leon's books, and in some are important plot devices, as in Acqua Alta aka Death in High Water (1996) and Beastly Things (2012). ^ "Why do the entry doors to most homes open inward, while in most public buildings, the entry doors open outward?". 2001-03-02. Archived from the original on 2017-09-20. Retrieved 2017-09-19. ^ "Türblattgrößen nach DIN 18101". Archived from the original on 2015-02-19. ^ "DIN 18101 Maßnorm für Türen grundlegend überarbeitet". Archived from the original on 2015-01-22. ^ "Protecting Children's Fingers from Door Injuries" (PDF). The Redwoods Group. Archived (PDF) from the original on 2012-03-24. This article incorporates text from a publication now in the public domain: Spiers, Richard Phené (1911). "Door" . In Chisholm, Hugh. Encyclopædia Britannica. 8 (11th ed.). Cambridge University Press. pp. 419–420.